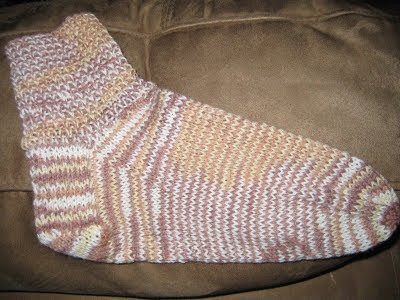 I'll start off today with one finished sock. 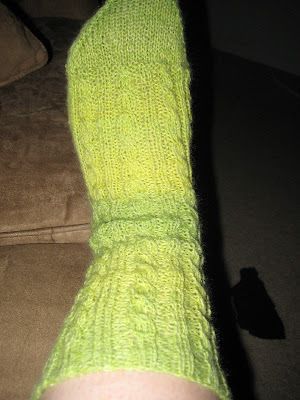 The pattern is BFF socks by Cookie A.. 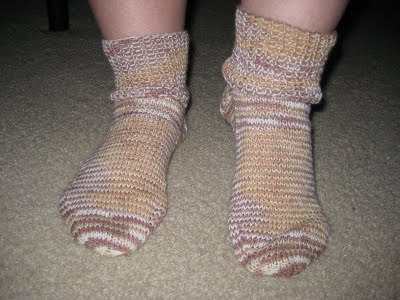 I can't wait to get the matching sock on the needles. I'm sure the pair of socks will turn out cute. I was more in love with the yarn before I actually knitted it. I just keep buying cheap yarn. I have to learn to splurge on better yarn. I'm watching ESPN right now. Brett Favre is giving a press conference about coming out of retirement and signing with the Minnesota Vikings for $25 million over two years ($12 million for the first year and $13 for the second). While I'm not really a huge football fan, I am surprised that this man is giving a press conference while dressed in a ugly t-shirt, a worn and beat up cap (not even a Vikings hat), and unshaven. This is a man who was offered $25 million to stay retired for goodness sakes. He reminds me of Steve on his day off....as long as he's clothed, then he's good to go. The office I work in has a lot of turnover of personnel. The percentages are pretty equal, with half quitting and the other half getting the boot. The revolving door is a major annoyance, especially when a good worker makes the decision to get the hell out. I just get stuck with covering the work until the next contender comes along.